In college, I spent $5 on a poster of Van Gogh’s “Bedroom in Arles” to cover up the ivory cinderblock walls of my dorm room. A few years and many twists of fate later, I stood an arm’s length from the original painting at the Van Gogh Museum on my first visit to Amsterdam. It ignited a love affair with the city that endures to this day. It’s got amazing art, fantastic design, beautiful architecture, and more than its share of great places to eat and drink. It’s far enough away that people from work will say, “don’t bother him with that, he’s in Europe.” It’s close enough that I can fall asleep at night on a plane in the States and wake up in Amsterdam at sunrise, rested and ready. Friends joke about the frequency with which I visit the city (annually) and regularly ask me for see-and-do advice if they find themselves there. So here’s my list – great for first timers and frequent visitors alike. Unfortunately, there are far more places than any list will allow. Many of these discoveries have been made just by wandering aimlessly around the city, which is an activity I highly encourage. Once you land at Schiphol, it’s going to be a quick 15 minute train ride to Amsterdam Centraal Station. Stop at a bright yellow machine for a ticket (about 6 USD each way) before you head underground to find an intercity train. From there, I usually head to my hotel or houseboat to drop off my luggage until my room is ready. Then it’s time to decide what sort of day you want to have. As soon as you arrive at Centraal Station, exit to the South (away from the river) and you will be staring down the main street of the city center, Damrak. Off to the left, you’ll see a massive church and the Hotel NH Barbizon Palace. A few doors past it is Prins Heerlijk, my all-time favorite sandwich place. No matter what time I land in the city, my first stop is always there for salami, brie and cold butter on a hard baguette (their menu is extensive and they will make you a sandwich out of just about anything). There is table service if you want to linger for a bit, or you can walk up to the counter and order to go (“for takeaway”). It’s worth tucking a sandwich in a sack in case you get hungry or find a cool picnic spot later. Another place I visit almost every time I am in town is Puccini. If you plan to see Rembrandt Square and the Night Watch statues, you’re only a few blocks away (it faces the back of the National Opera). It’s touted as an espresso bar, but it’s actually a very sleek cafe where there’s no separation between the seating and the kitchen. 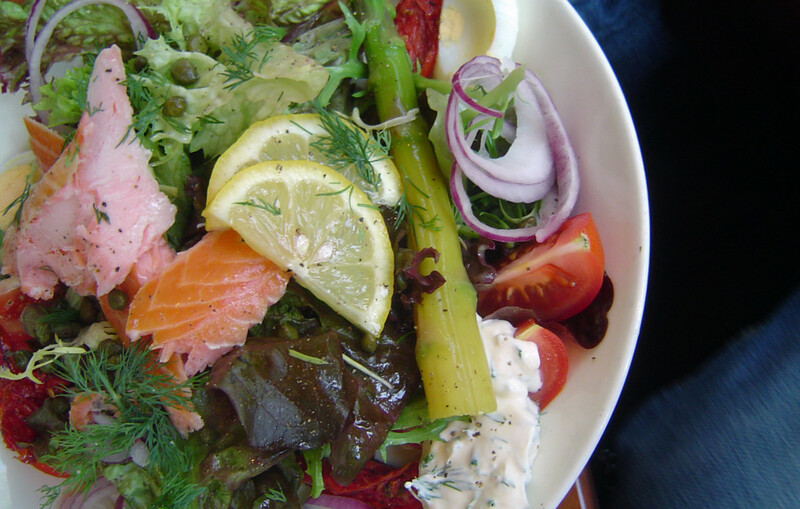 Great soup, sandwiches and perhaps the freshest salad you will ever find are served here daily. Foodhallen is basically an overwhelming indoor food court of delicious food options of all types. Restaurant de Kas is a restaurant inside of a greenhouse situated in a public park. You will need to take a tram or taxi to reach it, but it is absolutely worth the trip. Much of what is served in the restaurant is grown on site and it is ideal for special occasion meals of all sorts (reservations recommended). De Blauwe Hollander specializes in traditional Dutch faire. It’s not far from the Rijksmuseum, tucked away on a small street one block from the Leidseplein. It’s small but worth the wait. They are open for lunch and dinner (reservations suggested for dinner). Try the bitterballen. Perhaps poorly named, these are delicious balls of stew that are breaded, deep fried and served with spicy mustard. 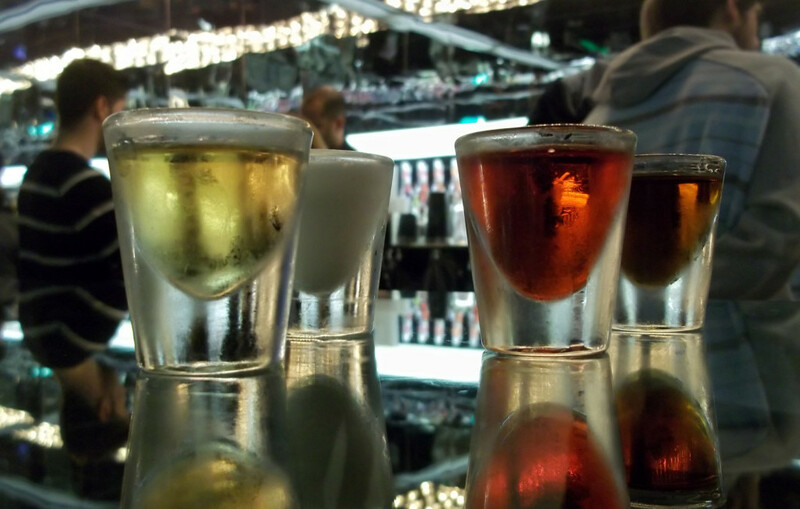 The Bols Experience combines the class of a museum with the amusement of a quality cocktail. Bols is the premier maker of Genever (Dutch gin). Forget everything you know about gin before you go, because it is not what you expect. As a bonus, your admission price includes one expertly made cocktail crafted by exceptionally skilled bartenders, two tastings of your choice of Bols signature cordials and a chance to learn to toss bottles. The Dutch tasting tavern Wynand Fockink has been offering spirits since 1679. Their website describes what they do better than I ever could: “more than 70 Dutch liqueurs and genevers which can be tasted in an authentic 17th century environment in the old time honoured way of bowing to the drink and slurping the first sip from a traditional tulip glass.” If a less adventurous drink is more your style, just around the corner is Bubbles & Wines, an intimate champagne and wine bar. In addition to the Heineken brewery which you can tour, there are two fantastic smaller breweries in town that are worth a visit. Brouwerij T’ij exists next to an old windmill along the river. Join the crowds outside on any day the weather is decent for a beer or two. Brouwerij de Prael is closer to the center of town and has a cozy, neighborhood hangout feel. Though I have never stayed at the Andaz Amsterdam hotel, I stopped in because the decor is the work of famed Dutch designer Marcel Wanders. It is worth having a cocktail in the lobby bar just to admire the imaginative and outlandish interior. One of the more unique activities I have ever encountered is Koan Float. 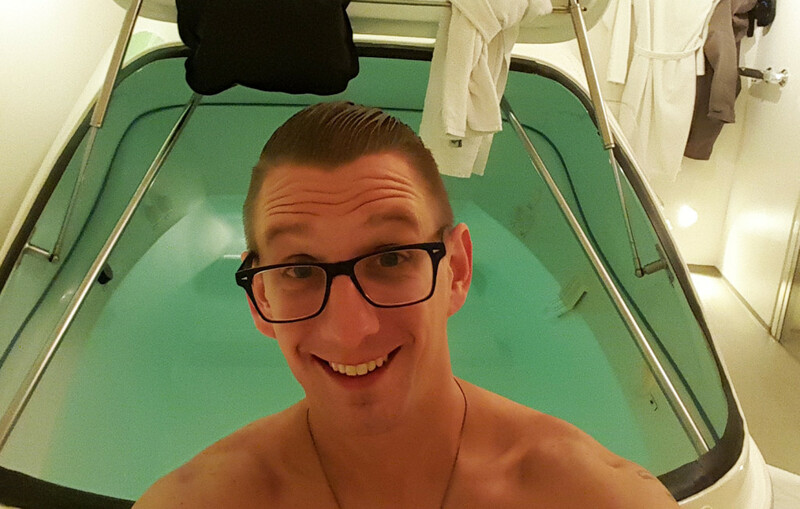 Make reservations for a float session, even if spas are not your thing. A 45-60 minute reservation gets you a private room with a shower and an enclosed chamber full of salt water so dense that you cannot sink. You control the lights and the music and truly have the opportunity to tune out the entire world to relax. Talk about a great way to beat jet lag! I also try to spend the last night of each of my trips to Amsterdam on a canal dinner cruise. It is a relaxing and quiet way to see a lot of the city the night before what is usually an early flight home. Most of the canal cruise boats have glass roofs, so even if it’s chilly or raining, it’s still a great way to take in the sites. Cruising the canals after dark is more charming than the daytime: it’s neat seeing the decor inside all of the huge old apartments when they’re lit up at night. Second perhaps only to the Louvre in Paris in scale, the Rijksmuseum tops my list of places you can spend several days viewing art. For both it and the Van Gogh Museum immediately behind it, I highly recommend that you book tickets in advance online. When you arrive at each, you’ll see a tediously long line to get in. In both cases, you can walk right past the line into a separate door if you already have tickets. In addition to the many great museums and cultural events inside the city center, there are a lot of neat sites to see just outside Amsterdam if you want to explore more of Holland. Check with a tour agency or hop a train for a day or half day trip to one of these cool spots: Zaanse Schans, where you can climb up inside a still-operable antique windmill; Apenheul where monkeys run free in one of the largest open air primate parks in Europe; Keukenhof (seasonal) is arguably the largest tulip garden in the universe; and the town of Delft is where the famous blue Dutch pottery is still crafted and hand painted. The Amsterdam-based design studio and store Droog always has a lot of intriguing decor and lifestyle products. The Nine Streets is a nine square block section of the city where the streets take a new name each block. Designer boutiques, art galleries and specialty stores line each, making it a fun area to spend time window shopping. The Waterlooplein Market is a large open-air flea market located just behind the National Opera house, adjacent to the Amstel River. CityMundo was helping people sublet short term apartments long before AirBnB arrived on the scene, and my experiences with them have always been fantastic. Spring for a houseboat if your budget allows it, especially one with an outdoor deck or patio. It’s really a remarkable way to experience the city from a very unique angle. The Mercure Hotel Amsterdam Centre Canal District is a little farther afield than I usually stay, but is still walkable from the city center. The room was impeccably decorated, and the rate was very reasonable. 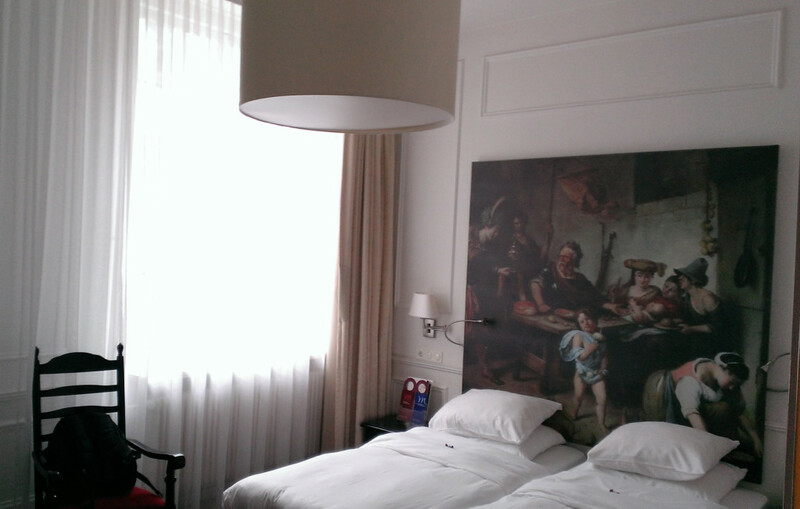 The NH Grand Krasnapolsky is as centrally located as you can get. It looks out on Dam Square at the center of the city, opposite the palace of the Dutch royal family. It has been extensively renovated in recent years and its rooms are modern, trendy and comfortable. The Grand Hotel Amrath is a luxury hotel situated conveniently near the train station at the north of the city. Both times I have stayed here, I’ve been impressed by just how spacious the rooms are. The ceilings are absurdly high, and each room contains a complimentary minibar, Nespresso maker, and the lavishly appointed bathrooms.